Richard Thaler has just won the highest prize in economics for his stellar work in behavioural economics. But India is no stranger to some home-grown nudgers of its own. It is part of human nature to celebrate current achievements and forget past ones. It is natural. But frustrating. Thus, while we celebrate Richard Thaler winning the Sveriges Riksbank Prize in Economic Sciences in Memory of Alfred Nobel for the year 2017, we have forgotten how T.M.A. Pai, who founded Syndicate Bank, also pioneered some of these key ideas many decades before. More importantly, Pai achieved these in practice with little academic work to guide him, whereas Thaler’s ideas were first developed academically and then he put them into practice (this is, it is to be noted, what makes Thaler different from previous winners). The idea is not to take any credit away from Thaler but to give credit to someone else as well for thinking through these ideas. Let me explain. Thaler got the coveted prize “for his contributions to behavioural economics". The committee cites three of his major contributions to the field: limited rationality, social preferences and lack of self-control. In this article, we will just focus on lack of self-control which, as the term indicates, is self-explanatory. Human beings wish to save for future, lose weight, plan time better and so on, but more often than not end up doing the opposite. Why is this so? There is inertia, a preference of current over future, a habit of postponing things and a host of other such factors. Enter Thaler. He advocated interventions he called “nudges" which could help individuals bypass, or get around, this lack of self-control. His key idea was this: people make choices while making all these decisions. Now, if the choices could be designed in such a way that most people choose the appropriate choice then the job is done. They have been nudged optimally. This, placing salads ahead of desserts on menus or at a buffet, promoting prepayments for gym membership et cetera could help people cut down on calories and exercise more. All these interventions are nudges that help people act in ways better than they would without them. The effect of such Thaler-ian nudges was especially seen in area of savings (this is also how Pai comes into the picture). To encourage people to save for retirement, Thaler advocated a change in the default option in retirement plans that was offered to employees when they joined American firms. While enrolling into a job, people were also given a retirement savings form which framed the question as “We have a savings program for retirement. Would you like to be enrolled in it?" To this, most people said no despite wanting to save for retirement. Thaler advocated changing this default question to “We have enrolled you in the saving program. Would you like to exit from the same?" This change of default from giving a choice of entering the program, to automatic enrolment with an option to opt out, led to widespread enrolment in retirement savings schemes. Later, Thaler, along with Shlomo Benartzi, made another variant of this idea, calling it “Save More Tomorrow". In this “nudge", contributions into a savings pot increased automatically as the employee got salary raises. Overall, research has showed, this automatic enrolment increased the participation rate in a 401(k) savings plan in the US from 49% to 86% (Madrian and Shea, 2001). Now let us get to Pai and try to understand his connection with this way of thinking and intervening. Pai, who was a medical practitioner, started a bank, along with his brother, in Udupi in 1925. The bank had a long-worded name: Canara Industrial and Banking Syndicate. This was later changed to the much more wieldy Syndicate Bank. We will stick to this name for the sake of convenience. Udupi was hardly Bombay or Calcutta, where starting a bank was a natural outcome of the economic activity in the city. In the 1920s, the gap in Udupi’s economic might was even wider given a lack of transport and communication technologies. Moreover, the timing of setting up the bank was highly challenging as the Great Depression was about to hit the world economy within a few years of the bank’s founding. Given all this, it was highly difficult for the bank to mobilize deposits or give credit. The promoters were undeterred. Moreover, in 1928, a moment of brilliance changed the history of the bank. Pai used to double up as both doctor and banker in the early years of the bank. This professional combination may raise eyebrows today, but it served the bank very well. As a doctor, he knew Udupi and the surrounding areas well and, as a result, could develop banking services tailored to local demands. One evening, he prescribed a lady patient medicines which were hardly expensive. As he was closing his clinic, he saw the same patient sitting outside. The patient said that she had no money to buy the medicine. On further questioning, Pai realized she had no savings whatsoever to spend on his prescription. Pai lent her some money. But then the thought just struck him: how come people do not have any savings? More importantly, can my bank help in the important endeavour that was helping them save? 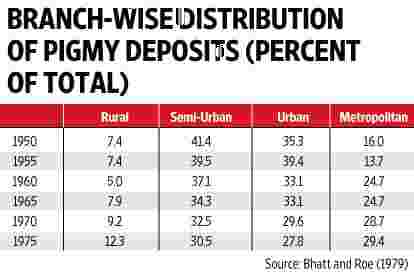 After much thought, Pai formulated something called the Pigmy Deposit Scheme. The idea was to mobilize any amount of small savings from all possible income groups regularly. A depositor had the flexibility of making these pigmy deposits daily, weekly or monthly. But once they chose a frequency, they had to deposit money on time. People were exhorted to save as little as 25 paise daily, which at the end of seven years would be accumulate to Rs700 at a simple interest rate of 3.5%. Pai understood that people would not come to the bank to deposit their savings due to a lack of self-control, discipline and even awareness. To address this, he appointed door-to-door deposit collectors. These collectors visited depositors at home, as per their committed frequency, to collect these deposits (this was a precursor to similar reminder techniques used by banks today where they inform us via SMS, email, et cetera). If one looks at the advertisement of the scheme, it resembles today’s nudging strategies strongly. 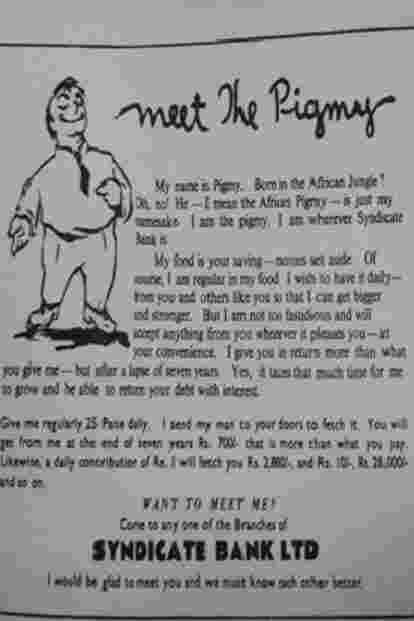 An old Syndicate Bank advertisement. Just like we see in some of today’s more successful nudging experiments, the impact of this scheme was widely felt. It demonstrated the importance of thrift and savings to people—many of whom had no grounds to appreciate this before. In fact, this was a time when most parts of India, including Udupi, suffered from usurious interest rates. But here was a bank which not just gave them loans at lower rates, but even promoted their well-being via savings. The testimonies of some of the pigmy depositors shows this emphatically. One woman fainted upon hearing the amount of saving, another asked Pai not to inform her husband about the savings and yet another built a house using the savings, calling it Pigmy House. The bank also benefited significantly from these deposits. First and foremost, the bank could mobilize deposits which, as suggested above, were highly difficult to come by in those days. 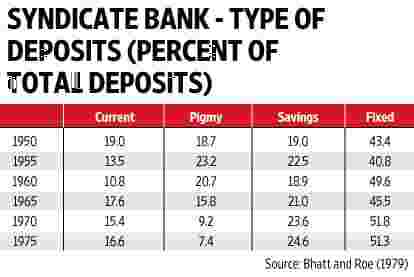 The share of pigmy deposits in total deposits at Syndicate Bank reached nearly 25% by 1950s and then declined as the bank gained other types of deposits. Secondly, this turned out to be a clever competitive strategy. No other bank extended such a scheme. Not even in the cities. The branch-wise distribution of these pigmy deposits shows that the scheme was popular in urban and metropolitan areas. Third, the costs of these pigmy deposits were much lower than costs of regular savings and fixed deposits. Fourth, the bank’s faith in the small customer reaped large dividends. Even as banks across India failed during multiple banking crises over the subsequent century, Syndicate Bank remained stable. The trust of the bank’s management in its small depositors and that of small depositors in the bank stood the test of time. All in all, the scheme achieved pretty much everything which modern day nudgers try to do with their various financial savings scheme and experiments. One should especially note how these schemes appealed to female customers, as highlighted earlier. However, just like most things to do with history in India, the lessons from the scheme and Syndicate Bank’s ensuing success have all been forgotten. So much so that one now gets to read about how certain academic researchers are running experiments with door-to-door deposit collection schemes (Ashraf et at 2006, Callen et al 2014) in papers that make no mention of either T.M.A Pai or Syndicate Bank! It is not that the bank remained a small bank and hence stood a greater chance to be forgotten. The bank grew to become one of the top 10 largest banks in India by the 1960s and does merit attention to its accomplishments. One cannot, of course, blame Thaler for not knowing any of this as we ourselves are ignorant of this significant achievement in the past. We have hardly done any notable research on the topic, with N.K Thingalaya (1999) being the sole exception. To me, the Riksbank Prize shows how humans have always had these biases and inertia towards savings. These biases necessitate that, when looking at these problems, an approach different from the rational being-reliant neoclassical models is required. This different approach was ably demonstrated by Pai in the 1920s and seven decades later by Thaler. It is tragic that we celebrate one and do not even remember the other. Amol Agrawal is a PhD student at IIM Bangalore working on Indian banking history. He writes a blog called Mostly Economics.